John A. Voelpel, III has been involved in the Appraisal process over eight-hundred times and has been named as the Umpire in over 93% of those Appraisals. 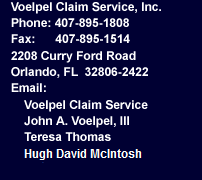 John was on the Umpire Directory Committee of the Windstorm Insurance Network, Inc. from its inception. He has taught the Umpire Certification Course for WIND and drafted a Code of Ethics to be followed by Umpires listed in the Umpire Directory. A list of disputed claims and Court appointments in which John has been involved will be provided upon request.